On August 14, the Mars Curiosity Rover photographed an object that appears to be a thigh bone on the Martian surface. When the photo was released by NASA’s JPL affiliate a few days later, initial observers claimed that the object was a fossilized bone fragment. The first thigh fossil claims on August 20 generated much media attention and public controversy with coverage by major media outlets such as the Huffington Post and Britain’s Daily Mirror In an unusually quick response, NASA replied to the growing controversy on August 21 by claiming that the object was little more than a rock. Today, Science.com released a story backing NASA’s claim that the photo is nothing more than a rock. Not so according to a growing number of independent researchers that have uncovered past Curiosity Rover images of what appear to be different life forms on the Mars surface. After fossilized spine and finger now NASA Curiosity on August 14, 2014 photographed fossilized thigh bone-like object on Mars. No bones about it! 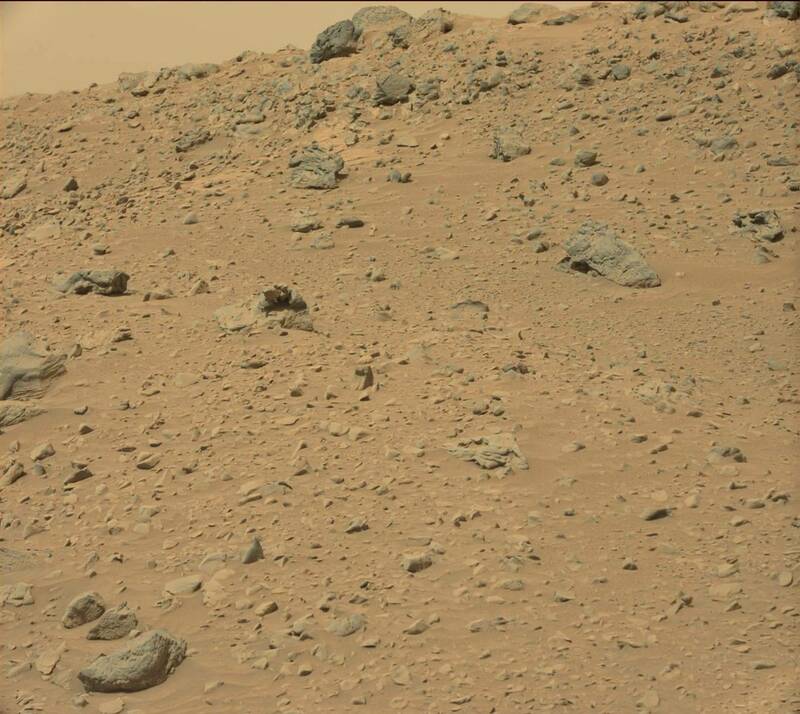 Seen by Mars rover Curiosity using its MastCam, this Mars rock may look like a femur thigh bone. Mission science team members think its shape is likely sculpted by erosion, either wind or water. If life ever existed on Mars, scientists expect that it would be small simple life forms called microbes. Mars likely never had enough oxygen in its atmosphere and elsewhere to support more complex organisms. Thus, large fossils are not likely. While Space.com and other major media outlets appear satisfied by NASA’s explanation, independent researchers disagree. In fact, past Mars Rover images show what clearly appear to be animals roving the Mars surface. In August February 2013, for example, a Curiosity Rover photo showed what appeared to be a duck on Mars. Another Rover Curiosity image taken in February 2013, showed what looked like a lizard on the Mars surface. In yet another photo from Curiosity Rover captured on September 2012, a squirrel appears to be on Mars. Finally, in a series of five images captured by the Spirit Rover in 2009, an object clearly appears to have moved; curiously, NASA experts refused to comment. NASA’s explanation that all the above images are merely rocks appearing to be animals or fossils generates heated controversy not only in the general public, but among NASA scientists themselves. Richard Hoover worked for NASA as an astrobiologist for 46 years, and claims that in 2004, the Mars Rover, Opportunity photographed what clearly looked like the fossilized remains of a crinoid, a marine animal that looks like a sea lily. Hoover showed it to colleagues who immediately recognized the object as a crinoid. However, rather than examine the exciting possibility that Opportunity had photographed the fossilized remains of a living organism, Hoover said that less than four hours after taking the photo, Opportunity’s rock abrasion tool ground the area where the possible fossil lay into dust. He asked David McKay, the former chief astrobiologist at the Johnson Space Center, why this had been done. According to Hoover, the answer he received was less than satisfactory. Hoover’s conclusion was that senior NASA scientists were actively destroying evidence of Martian fossils. If animals do roam the Martian surface, as Mars Rover photographs suggest, then bone fossils and bone fragments will also likely be detected on the Mars surface as Hoover claims. Photographic and whistleblower evidence suggest that NASA’s explanations that Mars Rover images are nothing more than rocks, appear to be obfuscations designed to mislead the general public about the true composition of the Mars atmosphere and of life on Mars. A rare set of NASA photos of astronauts training on the lava fields of the Big Island of Hawaii were publicly released today. The Big Island has been a favored destination for NASA to send astronauts to train in environments similar to the Moon and Mars. The photos show a variety of situations where astronauts are seen testing equipment for upcoming lunar missions and future landings on Mars. The volcanic lava fields are not only to be used for training earth astronauts for trips to the Moon, Mars and beyond. If officials from the reinstated Kingdom of Hawaii have their way, alien astronauts will soon land on Hawaiian lava fields to meet humanity. It appears that Hawaii’s lava fields are suitable for astronauts from both earth and alien worlds to spend some time visiting. The NASA photos were released by the Hawaii based Pacific International Space Center for Exploration Systems (PISCES) whose mission statement is to assist “aerospace agencies from around our planet to develop, test, and validate in Hawaii pioneering technologies that can advance robotic and human missions to space.” In the late 1960s, scientists recognized that the Big Islands lava fields bore “an uncanny resemblance to the terrain on the Moon,” Astronauts from Apollo missions 13 to 17 trained on the Big Island’s lava fields. In a blog post PISCES describes its efforts to locate the photos from NASA to document Hawaii’s role in helping send astronauts to the Moon. On May 28, the Reinstated Kingdom of Hawaii issued a “Declaration for a Hawaii Star Visitor Sanctuary” setting out its goal of converting some of the Big Island’s more recent lava flows into a place where alien astronauts can land and meet with humans. According to the Declaration, Hawaiian legends reveal that the native Hawaiians are descended from extraterrestrial visitors from the Pleiades star system. Representatives from the Reinstated Kingdom claim sovereignty over new land created by recent lava flows, and plan to dedicated some of it for extraterrestrials to land in a special ceremony on June 27 that will be part of an upcoming Hawaii Sustainability event. The lava field designated for alien visitors is in the Kalapana area of the Big Island, only an hour or so car ride to the lava fields used by the Apollo mission for training astronauts for moon missions. Even closer is the Hilo office of PISCES where the Apollo images are proudly hanging on a mural. The Big Island of Hawaii’s lava fields, according to PISCES, offer an exciting venue for national aerospace agencies to send astronauts. If the Reinstated Kingdom of Hawaii succeeds with its plans, U.S. and other astronauts will be joined by alien astronauts in visiting the Big Island’s volcanic terrain.